This is the third of a five-part series about the “stages” of personal finance. In the first part I described the zeroth stage of money management, in which I was fumbling in the dark, spending compulsively and accumulating debt. Last week I described the first stage, in which I finally saw the light and began to repay my debt. Today I share what happened next. What amazed me, however, was that I not only knew what Mike meant, but that I also regretted missing a chance to move my savings someplace they could earn higher interest. I felt like this was another sign that I'm in (or past) the second stage of personal finance. Before my financial awakening, I wouldn't have had money to save. I was still accumulating debt. (What's more, I had no idea what a certificate of deposit was. And if I had known, I would have thought it was boring.) During the first stage of money management, I had some inkling about CDs and CD rates, but I still didn't have money to save. My extra cash all went to repaying debt. But I've spent the past fifteen months in the second stage of personal finance. Now a five percent certificate of deposit is exciting. The very thing that might have once seemed boring now seems fun. In December 2007, after I paid off my consumer debt, I felt lost for a few weeks. For more than three years, I had been working toward a single goal: debt elimination. I had learned to pinch pennies, sacrificing momentary pleasures for a higher objective. But now that my debt was gone, I didn't know what to do. Ultimately, however, the transition from the first stage of money management to the second was less difficult than I feared. For one thing, I had already developed solid financial skills while working to get out of debt. By cutting my expenses and increasing my income, I had generated free cash flow of over $1000 a month. Back in the zeroth stage, when I was living paycheck-to-paycheck on $42,000 a year, I could never have imagined freeing up $1000 a month. Yet in just over three years, I did just that. I've increased my emergency fund from $1000 to $12,000. To do this, I took the money I had previously been applying toward debt and funneled it into savings. I've begun to save for other goals. I'm saving for a new car, and have also begun to save for vacations. I've been teaching myself about investing, and have started to save for retirement. I opened a Roth IRA and a 401(k), and each year I contribute the maximum I am allowed. I've taken the skills I had learned in the first stage, and have turned them into habits. The things I did in order to save money to pay off my debt, I now do because they simply made sense. Most of all, I've learned to be satisfied with the things I have instead of longing for the things I don't. A rich life comes from family and friends, not from owning more Stuff (or new Stuff). For me, one of the toughest battles of the past fifteen months has been the tendency to be too frugal. I've sometimes crossed the line from frugal to cheap. I think this is natural for those of us who once were compulsive spenders. We react by swinging too far in the other direction. That's okay. As long as we're able to use these moments of miserliness as learning experiences, they're not bad. I'm not sure that the second stage is the place where we search for balance (I think that's for the third stage), but it's where we become aware that spending too little can be as much of a problem as spending too much. As I say, this second stage is fun. It's exhilarating. I get a thrill out of seeing how much money I am paying myself instead of paying to other people. I enjoy imagining what my savings will allow me to do in the future. It will let me spend more time reading and writing. If I'm lucky, it may allow me to retire early. I've been a slave to metaphors during this series. I keep searching for some image to help me convey the journey from financial ignorance to financial independence. Today I want to try out one more (the first one I ever used). Money management is like building a home. During the first stage, you clear the construction site, hauling away debris and rubble, and getting the area ready to build. During the second stage, you pour the foundation. You've eliminated your debt and you've begun to restrain your bad habits; now you can establish a solid foundation on which to build the financial home of your future. A fat savings account and fully-funded retirement plans are not objectives themselves. They're tools to help you accomplish the things you really want. For me, they're the keys to financial independence, which is the fourth stage of personal finance. Note: This series is intentionally less “polished” than most articles at Get Rich Slowly. It's a chance for me to think out loud, to explore the stages of personal finance with you, the readers. Photo by Jenny Downing. 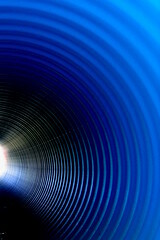 There are 25 reader responses to "The Light at the End of the Tunnel". Yes, I think that one important thing to remember is that we always need some investment money available to us so we have money to invest in those deals of the century. Come on J.D. was that on purpose or an accident? Thanks for the metaphor fodder I’ll be teaching poetry, similes and metaphors this week and I’ll use this one. Wow, good points! When we reached this stage (just 3 months ago!! ), we were so much more interested in finding the best savings rates and accounts. Nothing more about spending it on Stuff!!! I’m also like you in tending to go toward cheap, bypassing frugal. I’ve got a wonderful husband that keeps me in check with great common sense!!! Good series JD and congrats on being debt free and well on your way to prosperity. I agree that the ‘getting out of debt’ phase builds fiscal muscles and mindsets that allow us to handle the new ‘free money’ each month. I’m still anticipating, but I imagine there is great joy and relief to be spending and saving YOUR money for YOUR purposes… saving for a new car or vacation is so much more fun than hacking away at a Visa payment. My spouse and I will have our house paid off in November, and we don’t have any other debt. I understand that “What do we do now?” feeling. Do we travel? Do we splurge on something big? Do we keep socking money away? We’re both in our early-40’s and have most everything we could ever want. The options are overwhelming. This is a good series J.D. These posts are very inspiring to anyone who is trying to get out of debt and live a debt free life. You have come a long way. Congratulations! Whew! Then I’m not alone! A year and a half ago I went through a divorce and found my financial house in ruins. I have been unyielding in my goal to NEVER live paycheck to paycheck and NEVER build up debt again. Last week I reviewed all of my financial records for the past 18 months wondering what percentage of every dollar that has landed in my pocket has gone to debt elimination or savings. My gut feeling was 15% but after much analysis I was quite wrong. The actual number was just over 30%! Considering that about 50% of my net pay goes to mortgage and utilities, I was left wondering… just what AM I living on and am I getting way TOO cheap? When I thought about it, I still go out to eat every other weekend, partake in my favorite activity skiing twice a week (thanks to my well used season pass) and really do not want for anything. Now I’m left wondering, just what WAS I spending all that money on previously? Thanks to all the great advice and encouragement from GRS to help me keep the faith. Due to my new financial situation I’m taking advantage of the great “fire sale” occuring on Wall Street to build the 401k retirement that I should have been working on years ago. I know the feeling. When we paid off our consumer debt it coincided with my husband receiving a raise. so not only did we have the money we had been paying debt with but we had a good bit more from his raise. I didn’t know what to do with it. We ate out a little more and of course we were saving the money, but I sort of felt like “Is this it? Is this what I do the rest of my life? Just save?” But that feeling generally went away. I realized saving could be exciting too. It was nice to get up in the morning and not worry about debt and know that if something did happen you could pay for it. But my suggestion for using some of the new found savings is to apply it in areas of your life you might have neglected. In our case that was our house. There were some things we fixed that needed fixing and helped increase the value of our home (or at least kept it from depreciating because of further damage). Maybe your car needs some repairs or your kid needs some tutoring or something you may have put off? Another good use of the extra money is to give it to a worthy cause. That was one of the more rewarding things I did with my money once I finally had some extra. It really felt good to give back even if it was just $20. I just arrived at the point of having paid off all the credit cards and have doubled my loan payment towards a home equity loan which put a new roof and windows on the house. I am doing calculations on adding to the mortgage payment to get it paid off in 12 years instead of 30. And trying to decide if all the costs are worth getting a lower interest refi (from 6.75) just to save $100 or so a month the bankers tell me. I feel like I need to move fast because I am already 46 years old (my fingers will barely let me type that number) and I came late to having any financial wisdom. Anyway, it is very interesting to read about others’ journeys. Especially how people arrived at the decision to be happy with having enough stuff already. We are a consuming society and everyone around me seems consumed with the idea of getting more and better stuff. I suspect I have traded my spending obsession for a saving obsession but will have a long road to finding that balance you spoke of JD. For now I will just bask in the knowledge of having put $555 between me and any looming emergencies. Congratulations J.D ! Just don’t forget to enjoy the ride to the third or forth stage and try and enjoy the scenery. I’m in the forth stage (or whatever)and without wanting to sound self-pitying (it pales of course into insignificance especially nowadays) but here be vultures too ! Congratulations on your milestone. I’ve lived well below my means the past 2 1/2 years to rid myself of consumer debt. If all goes as planned (ya right! ), I’ll have my house paid off. I haven’t considered yet as to what to do with the extra money, but my life now holds better promise than before. What I find hilarious is reflecting on what I was buying before I switched my way of living. I can’t really find the things I bought and for some reason, don’t miss the things I use to do. I guess getting older and having experienced frugality for some time makes you see life differently. I tried stopping by the credit union on Friday, as well. I couldn’t even make it through to the cookies, let alone new accounts. I overheard one of the agents telling another customer that they’d offer rainchecks on some of their offers. There are some areas of this stage which are a part of my life, but I think I am still in the previous stage more than I am in this stage. That’s okay…I’ll get there. Everything takes time. I’m glad you can see the light at the end of the tunnel and you have finished the stage. At this moment i can barely see a pale light somewhere far in the dark. I’m striving to get there. JD you were featured in my local paper, Baltimore Sun, yesterday. Congrats! One thing I can’t wrap my head around is… how could you or anyone max a 401 (15.5k) and fully fund a ROTH (5k) on 42k a year? That’s more than half of the gross salary and way more than 1k extra a month. JD, I love your down to earth writing style and personable posts. I think your blog is definitely one of my favorites on any topic, but especially personal finance. I do, however, have a suggestion for your metaphor. When you write your book, I’d like to submit that, as an architect, your metaphor needs one more piece: the plan. You can clear your site and get it ready without a plan, but once you start pouring the foundation, it’s very helpful to have at least a general idea of what your house will look like. I think that in personal finance, it is the same. Even if all your plan includes is the thought that you’ll fully fund retirement, or that you want to travel with family, or to pay off your house in full. Without a goal (you had one while you were clearing the rubble, the goal of eliminating debt), there is a good chance of pouring the wrong foundation. My husband and I are finding this ourselves, that once the debt is cleared, at least one long weekend of talking and dreaming and getting our heads around the idea of making plans for our future was an invaluable step. Obviously your plans include saving for retirement and paying off your house… Just a thought of how your great metaphor could be refined. JD, I love this series and as John said above, it’s very inspiring. I’ve been saving and paying off debt for a few years now and bought my first house a year ago. Unfortunately, I couldn’t save as much as I wanted at first because I was accumulating “stuff” for the new house, but the last few months have been a complete joy! I’ve spent sparingly on things that I want and I’ve been executing a great plan to be debt free by next year (minus the house of course). As Dave Ramsey says, I’m saving with gazelle like intensity. This post has really caused me to think about what my long term goals are specifically. One of the most inspiring things about Dave Ramsey’s philosophy is that we are creating a legacy and I TRULY want to get to the stage where I can gladly and willingly give as much as I can to help my family and friends because that is what it’s all about! That is how you create a legacy! I feel as if I’m in a ‘hybrid’ second stage. I’ve paid off my credit card debt, and while I still have student loan debt looming, I’ve begun saving money in earnest (I’ll have to work part time next year to account for school). I’m reveling in watching my savings accounts grow, because in the past—when I was spending up to 110% of my income—I didn’t have the discipline to allow money to sit and earn interest. I believed this was completely out of my power, and that I (like my parents) would never have control over my money. Now I know that I can live frugally (but well), I can work an extra job (or two) to get myself to where I need to be. I’m not there yet, nor am I even a full-fledged ‘member’ of step 2. But I’m on my way, and the journey itself is incredibly fulfilling. Means that your bills, food, etc are less than $800 a month? Am I missing something? Because I do not have an anonymous blog, I am intentionally being coy with regard to my income and contributions. What I’m trying to say is that I contribute the maximum I possibly can, within the confines of my income and circumstances, and within the confines of the law. Here’s a hypothetical: A couple that makes between $159k and $169k is subject to a phase-out of Roth IRA contributions. Sometimes I wish I had an anonymous blog because then I could share exactly what I mean. I’m just trying to say that I’m contributing as much as I’m able to retirement. Love your blog, J.D. One of the better ones I read. Congrats on the important milestones! Many good suggestions went in by your readers. I was one of the lucky suckers who scored a rain check at the credit union’s grand opening last Friday. (Have an appt to return tomorrow to finalize the deal). Was it ever crazy!! Being a little lost after completing a goal of paying off debt is a good problem to have. I think what JD is trying to say re: the retirement accounts is – he makes way more than $42k a year now and thus is limited by law on what he may contribute. JD – I assume GRS is organized as some sort of LLC or S corp? Why not set up a solo-401(k) for yourself – you can contribute the max deferral and an “employer” match for yourself.